A new Stainless Steel Cleaner from Rawn America removes and prevents water spotting for stainless steel equipment and hardware. 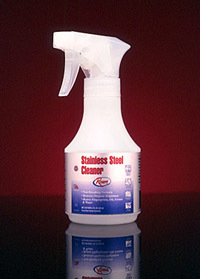 Unsightly water spots, residues, and streaking are easily sprayed away with this convenient to use stainless steel cleaner. After spray application, the user simply buffs the stainless steel with a soft absorbent cloth. No hard rubbing or polishing is needed. Water spots and streaking are gone while a protective surface is left on the stainless steel. Later, water splattering or misting simply beads up on the surface until it runs off or is wiped up. Rawn America's Stainless Steel Cleaner helps preserve the original factory finish of stainless steel surfaces such as tables, benches, cabinets, and hardware. The cleaner removes soils, grease, oils, dust and dirt. It is especially effective in removing fingerprint marks and oils that quickly blemish the surface. The product helps restore the original brightness of the stainless steel surface and then continues to protect it from re-soiling.The Stainless Steel Cleaner does not contain any harsh acids or alkalis that easily leave streaking residues and discoloration. Also, the product does not contain any abrasives that can mar the surface and leave hard-to-remove residues. It has been especially designed with a non-streaking formula to help maintain and preserve a clean and bright appearance. The new cleaner comes as a non-aerosol product in a convenient to use 8 oz trigger spray bottle. Its handy size easily fits on cleaning cart trays and in standard size drawers of stainless steel tables and work benches. A few quick sprays and light buffing keeps equipment and hardware in excellent condition. It's superior cleaning and preservative formulation makes it especially suitable for industrial, commercial and marine applications where water-spotting, fingerprinting and residue streaking are a concern.